If you are planning to add more character and functionality to your home, then you can always go for window and patio door replacement. 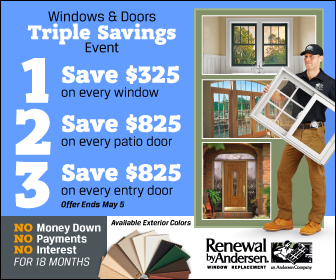 Depending on your home’s style, you can count on Renewal by Andersen® of St. Louis to provide you with the best window and patio door styles that will match and enhance your home’s style and function. One of the window types we use for home remodeling in St. Louis, MO, is double-hung. They feature mortise- and-tenon joinery that will add a classic look to your home, which works best if you are looking to restore its historical appeal. They also have sashes that you can open from both above and below, allowing you to control the amount of ventilation in your home. If you want windows that can allow more light into your living room as well as something that will let fresh air fill the area, then you can never go wrong with our casement windows in St. Louis. They feature a maximized glass surface area that looks great from both the inside and the outside. With a simple turn of a h and crank, you can easily open or close your windows and control the amount of breeze that enters your home. If you are looking into exp anding your patio and living area space, then hinged French doors in St. Louis are a good choice. They open into the room or outward to provide maximum patio or interior space. They also feature multi-glass panels that will allow more sunlight into your home, as well as Low-E glass that minimizes the damage done by harmful UV rays on your artwork and drapes. Have you ever wanted to bring the outdoors in? Our sliding patio doors provide a seamless transition between the inside of your home and the exterior. They move horizontally along a track, granting you ease of use and allowing you to save on space inside your home. They are also easy to remove for those times when maintenance is a must.